This is the story of two families - the Hamiltons and the Trasks. 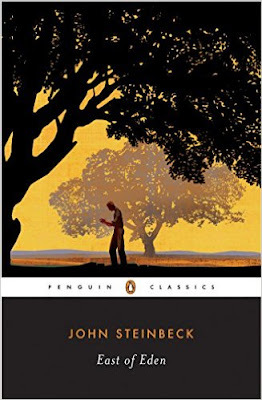 It takes place in and around California's Salinas Valley (which is actually where John Steinbeck was born) in the mid to late 1800's through the 1900s. This story spans multiple generations of these two families introducing many characters along the way. The Hamiltons were a large family of many children who lived and worked on a farm and barely got by. The Trasks were a more well off family with two sons that were raised by their father. Over the course of the book - both families have children, they grow, get married, move away, start their own families. Their families continue to interact over the years - each weaving into the other among various avenues. There is sadness and happiness, marriage and death, and everything in between. I enjoyed this book. It was.....long. I thought the writing was excellent. It might have been a little wordy - most in the story than needed to be to get his point across, but for the most part, it flowed nicely. The characters were likable and I found myself wanting to know what was going to happen to them. Sagas make great books because from where it starts to where it ends, entire lives pass through and you become invested in their stories. Check it out. You need to invest in this book - this is not a light read, or something you can do and watch TV at the same time. But it is worth it.